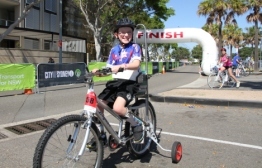 Early Sunday morning Mitchel Olsen took on the 15km Spring Cycle ride and not only did he hit nearly 40 kms per hour, but he also became the top fundraiser for the event; raising enough money to provide ten specially modified bikes for children with disabilities. “Today was awesome and I set a new record for my top speed. Thank you to everyone who donated because now I can buy ten bikes like mine for other kids,” said Mitch. Ten year old Mitchel has cerebral palsy and uses a walking frame to cover short distances and a wheelchair at other times. But this morning he clocked 1,888 kms on his Freedom Wheels bike from TAD. “The Freedom Wheels bike has been great. Mitchel can get on the bike and even play chasings with the other kids and he’s not just stuck in his wheelchair. Instead of being a spectator, he’s a participant.” Scott Olsen, Mitchel’s Dad. “Kids like Mitchel inspire our work every day and are living proof that the right equipment at the right time can change lives. This is what our volunteers work for and to see Mitchel’s achievement today is simply brilliant.” Alan McGregor, Chief Executive Officer, TAD Disability Services. Mitchel is a member of the Southern Cross Bike Club and rides every weekend with his little brother, Andy. The club gives him the opportunity to socialise and exercise with children his own age – a chance to participate in sports that doesn’t come along often for children with disabilities. Mitchel rides laps with the other ‘Under 11s’ every Sunday and completes an obstacle course laid out by the coach almost in the same time as the other kids. TAD Disability Services, is the only charity in NSW which designs and builds custom equipment to enable people with disabilities to lead more independent lives. Their Freedom Wheels bikes are specially made with extra supports for children who often cannot walk – but they can ride.